My mood is flat right now. I do not know whether it is combination of university deadlines and a lack of sunlight that is placing me in the dumps. Could it be the musings in my social science topics that make me realises how much the world is controlled and dictated by powers we cannot influence. Whatever it is, it is putting me a reflective “ponder the meaning of life” mood. So Right now I will give you my latest musing on life. In the hectic rat race of life we often overlook some of the best things in life; forgetting the treasures of the past. We have all rushed out the door to buy into the newest fad whether it is a new diet or health craze. We stock pipe and display massive amounts of generic retail products while we keep our antiques and prized items lock away behind closed doors. I wonder if we actually stopped and looked, could the increasing want for the newest and latest be destroying our sense of satisfaction? Sure there standards are lower than ours (hell, a few decades ago if you got one TV per family you were considered lucky) but they seem to not care about things as much e.g. the 60’s era. For me I often forget recipes that I really loved, book marked and everything but never have the chance to cook. I keep on stoke piling more and more recipes in greed, hoping to cook the one day. Trivial I know but cooking and baking food I am inspired by makes me happy. Bread is a special thing that always warms my heart every time I bake it. Sign, The power of flour and yeast. My cook book collection is a stock pile of food throughout the decades and nations. They originally were my mother’s recipes and cook books which she got from her cooking days back in Hong Kong. Did I ever mention that my mother used to cook the best Chinese steamed cakes and breads when I was young? One day I share you guys her recipe for the best steam sponge cake. She has not made this for many years which bring back to my point of the forgotten treasure of the past. Something as simple as a recipe can inspire a young girl to follow in her mother’s cooking footsteps. The most inspiring recipes, I find are one which have a deep rooted history. I have a special weak spot for the Jewish breads and food which have such meaning attached to them. 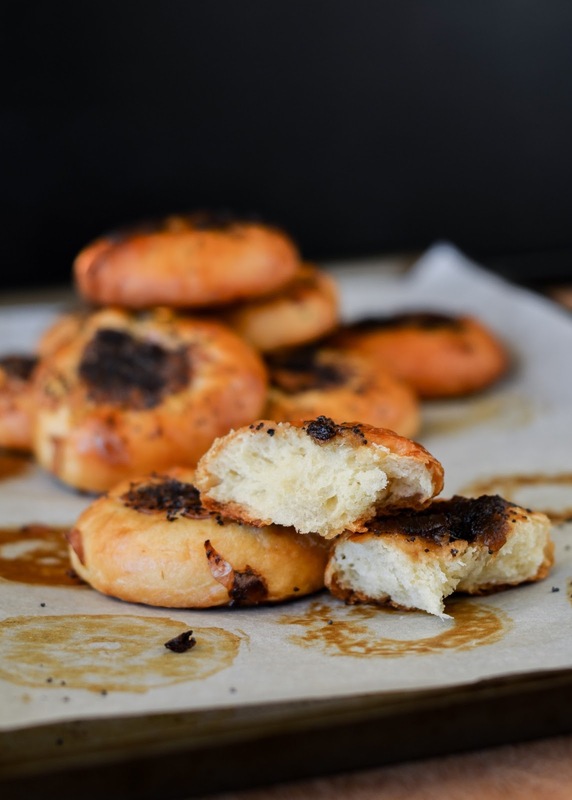 We all know about bagels and matzo but have you heard of Bialys? I found this recipe in an old scrap book my mother kept, I have no idea where it is from since it was hand written on a small piece of paper but it was so mysterious to me I had to try it. Researching this bread, it has deep connections with the genocide of the Jews and repression of a culture. 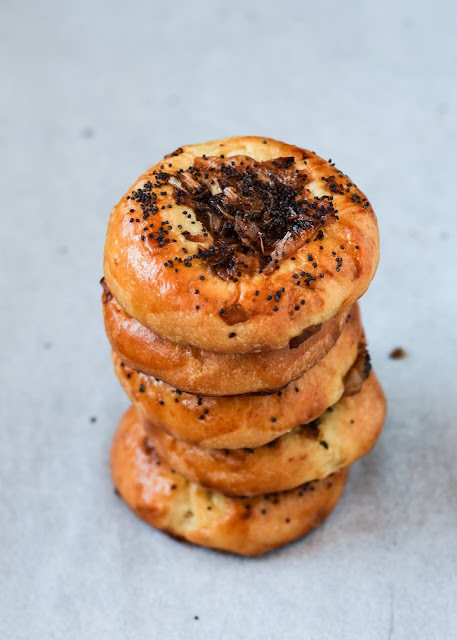 The bread is like a bagel but has a filling well which is stuffed with onions and poppy seeds. This is not boiled but it is over kneaded in order to create a small crumb which contributes to the chewy texture. The best part for me about this recipe is that it has survived over decades even with the odds stack against them. I might not be Jewish or have tasted a real ones of these, I hope to one day after this experience. 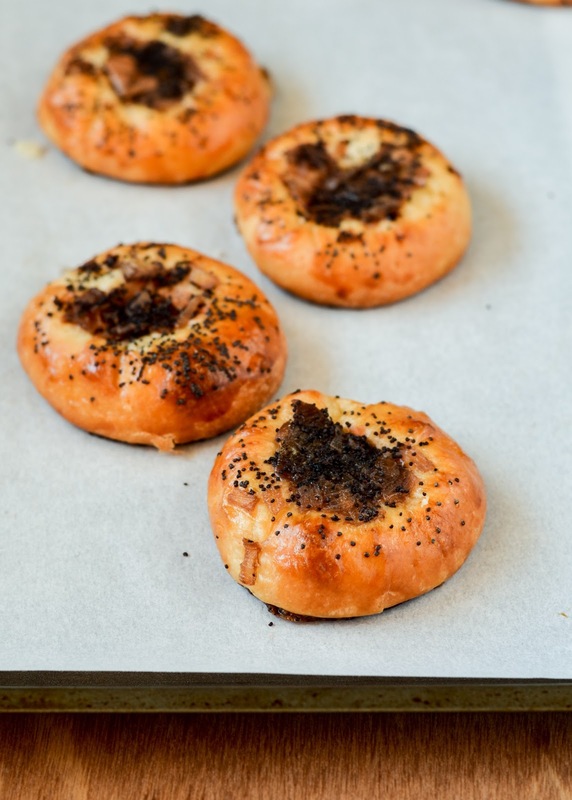 Chewy, flavourful rolls with a sweet onion filling and satisfying crunch by the poppy seeds. This is great but you don’t need me to tell you that. Make some for yourself! Well worth bread kneading effort. In a large fry pan, place 15g olive oil and allow to heat up on a medium heat. Place your onion and salt in the fry pan. In a large jug place yeast, sugar and warm water. Allow yeast to become foamy about 20 minutes. In a large bowl place your flour and salt. Mix to combine. Add the yeast mixture. Knead the dough until it smooth and elastic. About 30 minutes if done by hand. Cover with a damp cloth in an oiled bowl and set aside to rise for 1 hour. Once doubled punch it down and divide in to 40 gram balls. Allow dough to rest, covered for 10 minutes. Roll each dough ball in to a round shape. Using your thumbs, poke a well in the middle of the ball. Flatten and stretch this dent but do not go all the way though. Transfer to a lined baking tray. Cover and repeat with all balls. Allow to rise in the fridge overnight covered in cling film. Once they have come to room temperature, Place onion filling in the dents you have made. Brush with egg wash and sprinkle some more seeds on top. Once you place the bread in oven turn it down to 200c and bake for 20 minutes. Remove from tray to a cooling rack once fully baked. 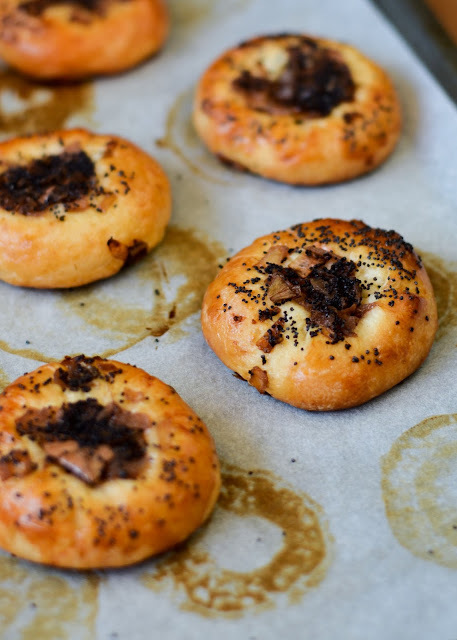 I feel like I can smell these savory little treats through my computer screen – and it’s definitely got my taste buds excited! They look amazing. Hey Thankks! I hope you try them some time becasue they are super easy. They make great sandwich buns. Toast them and stuff them! These look delicious – can’t wait to try them! I’ve never tried making them myself, but will now! These are my favorite street food when visiting NYC. Thanks for the recipe. These look great! 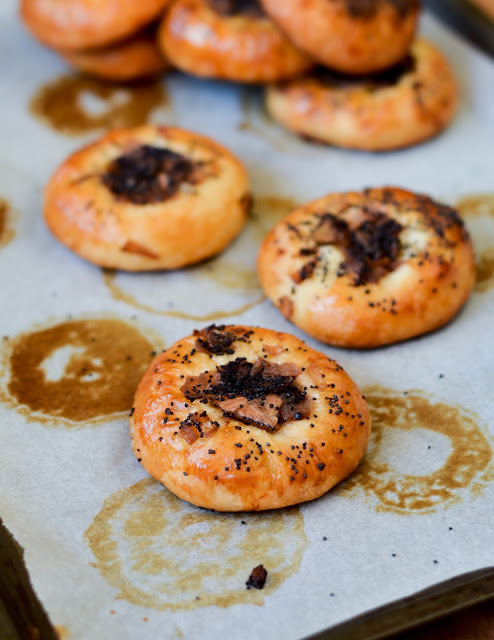 I love the addition of poppy seeds to the onions. Hey Sherri. The poppy seed and onion is actually the traditional way, but I think you can use other seeds too. 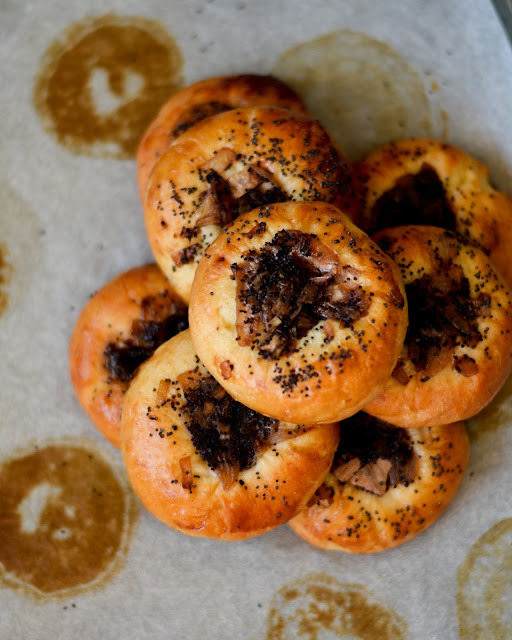 Seems only fitting that you are a Chinese woman who likes Jewish baking — I know quite a few Jews who really like Chinese food…. 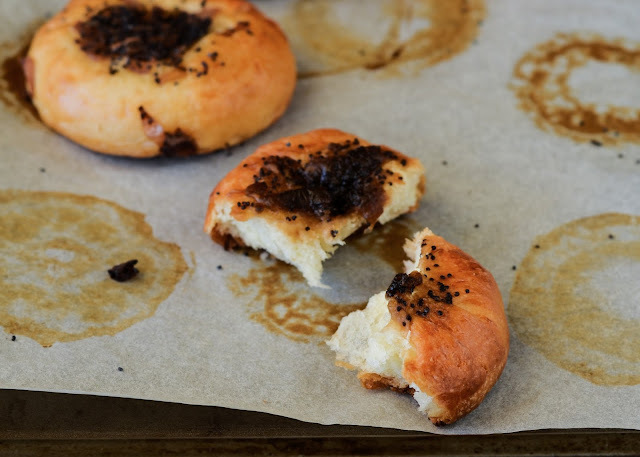 Best book on general Jewish baking is still George Greenstein’s “Secrets of a Jewish Baker,” which is essentially a guide to the best of New York-area baked goods. Biggest difference may be skipping the egg wash.
Hey Ken. The Jewish population in Australia is not as big as in the north nor are the food as celebrated as much. I love Jewish food as weird as it may seem. I will def check out that book. Ye the shiny colour to them is because of the egg wash. My family prefers breads with that coat for some reason. I would love to know if you have the secret to keeping the indent in place. I am annoyed when it puff up so much on baking. 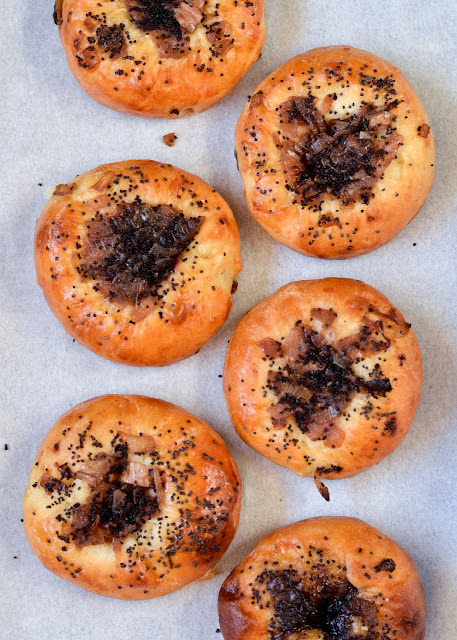 Bialys are an almost-forgotten Jewish bread — bagels are much better known — but they are still available in New York and Los Angeles (of course!) as well as in smaller communities near Chicago and Cleveland. I don’t know whether there are any Jewish (Eastern European — there are distinctly different breads in Sephardic traditions) bakeries in Australia; I haven’t been in touch with my relatives in Sydney, but I suspect there are a few there, or at least European bakeries that have a few Jewish specialties. I’m afraid that I haven’t looked for Jewish cuisine when I was in Australia; I’ve taken advantage of the excellent Asian restaurants in Sydney (Chatswood) and Melbourne. No secret — the forming instructions show a really thin center section; I’ll try to it even thinner next time. As you can see from my attempt, the center really wants to pop back out…. And if your family likes glossy egg-washed bread, you need to make challah, a braided rich bread made each week for the Sabbath. Greenstein’s recipe is fantastic, as are his instructions for a seven-strand braid (when you need to impress your guests). To get a really glossy finish, you brush the loaf twice with egg wash — once after forming, and again right before baking. Thank you for the tips ken! I would love to try a braided challah, maybe next time I get a break from University. That is great tutorial on how to get thin center thank you!